Hills Quarry Products’ popular 0 – 2mm Cerney Wick Sand is back in stock. Suitable for rendering and plastering or mixing with cement to produce a high-quality finish; Hills Quarry Products’ 0-2mm Cerney Wick Sand is available for delivery or collection from our Cerney Wick Quarry in Gloucestershire. 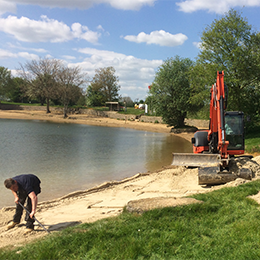 For more information about our 0-2mm Cerney Wick Sand or any of our other products contact our friendly and knowledgeable sales team on 01793 714999 or email aggregate.sales@hills-group.co.uk.